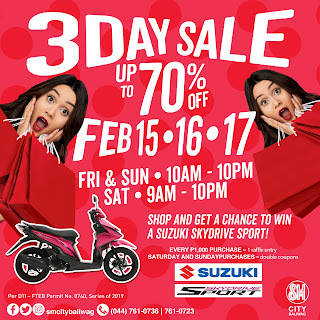 Start the year anew with all the great finds you want at unbelievable discounts as SM City Baliwag brings the first 3 Day Sale blast this 2019. Shop loud and proud as the Sale mania starts at a payday Friday- February 15 until Sunday, February 17. It is a shop-and-play experience as the 3 Day Sale not only brings big savings but also serves as great avenue for fun as exciting games and prizes awaits to be unlocked during the Sale. Be the first to bring home the awesome deals, as great discounts of up to 70% off applies to countless items mall-wide. Check out the latest finds from The SM Store, SM Hypermarket, Ace Hardware, Watson’s, SM Appliance Center, Surplus and Miniso. Meanwhile at The SM Store, SM Prestige Card members get EXTRA 10% OFF on great finds ALL DAY on Friday, February 15. SM Advantage Cardholders, SM Prestige and BDO Rewards Cardholders get EXTRA 10% OFF until 12NN on Saturday, February 16, and from 5PM-7PM on Sunday, February 17. Enjoy BDO Rebates up to 10% on credit card and 3% on debit card until February 17, and get a chance to win an OPPO F9 and Globe at Home Prepaid WIFI for every 2,000 single receipt purchase from February 15-17 at The SM Store Baliwag! Purchases not only brings winning savings but could also bring great opportunity to drive home a brand new SUZUKI SKYDRIVE SPORT! Just present single or accumulated receipt of P1000 and 1 coupon will be given on the 1st day of the sale which is on Friday and 2 coupons on the Saturday and Sunday. Grab your calendars and mark February 15-17. 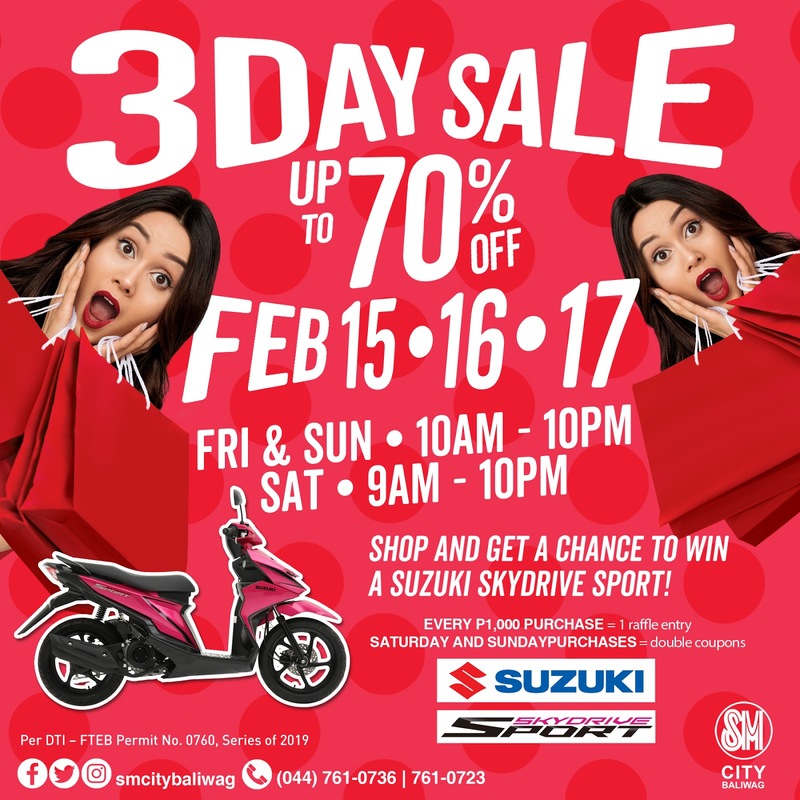 Dig the best deals only at SM City Baliwag’s 3 Day Sale blowout!